On Sunday, September 11th, over 500 guests from Los Angeles and Orange Counties gathered at The City National Grove of Anaheim to pay tribute to America’s heroes and honor the anniversary of 9/11 as a national day of service and remembrance at the fourth annual Life Changing Lives – One Nation. One Heart Gala. Life Changing Lives is proud to report having raised nearly one million dollars last night to benefit Wounded Warrior Project, The Joe Foss Institute, Pretend City Children’s Museum and Chapman University among other education charities. Philanthropists and Life Changing Lives Gala founders Mindy and Glenn Stearns proclaimed on the red carpet, “Tonight is going to make everyone at the Gala so proud to be an American”, which were fitting remarks for what was a star-studded celebration and an evening where so many inspiring men and women were honored. 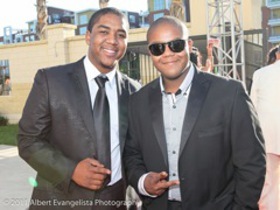 Joining the Gala to show their support were Kyle Massey, who finished 2nd on “Dancing with the Stars”, and his brother Chris Massey of Nickelodeon’s “Zoey 101”, along with the star of the Academy Award winning film “The Blind Side”, Quinton Aaron. Nestor Serrano of “24”, former Navy SEAL turned soap star Geoff Reeves and Gold medal world cup athlete Amy Purdy were also on hand to enjoy the festivities. The Gala opened with a powerful video montage featuring quotes about courage, sacrifice, spirit and patriotism from Presidents Roosevelt, Bush, Reagan and Kennedy and ending with reflections on freedom from Martin Luther King’s “I Have a Dream” speech. A high-energy dance and acrobatics number performed by the Fortune Entertainment dancers to a medley of Americana songs followed. Mindy and Glenn Stearns thanked our nation’s firefighters, police officers, emergency workers, members of the armed forces and teachers for their endless and selfless service, before introducing Reverend Robert Schuller who invited guests to join in a moment of silence to honor the memory of all who were lost on September 11th, ten years ago. The All-American Boys Chorus performed a salute to the armed forces while our honored guests from the Army, Navy, Air Force, Coast Guard and Marines all stood up throughout the ballroom to be recognized. The Los Angeles County Fire Department Honor Guard presented our colors while Firefighter Paramedic Humberto Agurcia sang a beautiful rendition of the nation anthem. As Humberto sang the final verse, the bald eagle Challenger flew overhead as a majestic symbol of freedom. Iron Chef Cat Cora presented the delicious menu she designed for the Gala in collaboration with The Grove’s Chef Mikery Hatfield. Guests enjoyed a Caprese Salad with Bloody Mary vinaigrette and buttermilk-soaked onions to start, followed by a dual entrée of Basque Beef Tenderloin with Chimichurri Sauce and Halibut with Sweet Corn Zabaglione. For dessert, guests enjoyed a Dark Chocolate Budino with Ginger Crème Anglaise and fresh berries. Karina Smirnoff and Dmitry Chaplin, from “Dancing with the Stars”, performed a moving piece entitled “A Tribute to American Heroes” to Tim McGraw’s hit ’If You Are Reading This" which they dedicated to the brave men and women who serve our country. Karina and Dmitry received a standing ovation for their beautiful Rumba about a soldier who writes his wife a letter to comfort her when he perishes in battle. EMMY Award Winning journalist Roy Firestone served as Master of Ceremonies for the Gala and introduced the video tribute to boxing champion and humanitarian Muhammad Ali. Roy then told an amazing true story of his first out of over 5,000 interviews he has done in his career, which was the interview he did with Muhammad Ali in Miami Beach, Florida. 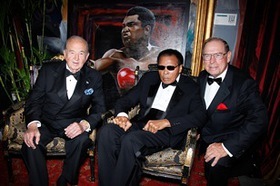 Roy went on to recount how he met up with “The Champ” at a nursing home in Miami Beach where Muhammad Ali was paying a visit to the senior citizens. Muhammad Ali asked a 95-year old man at the nursing home in his larger than life way, “Do you know who I am? What’s my name?” and after a few minutes of pause, the gentleman told Muhammad Ali that he had waited his whole life to meet the champ, none other than Joe Lewis. When a member of Muhammad Ali’s entourage went over to correct the old man, Muhammad Ali stopped him and told his team that there was no reason to rob this man of his dignity and that for today, he was happy to be Joe Lewis. 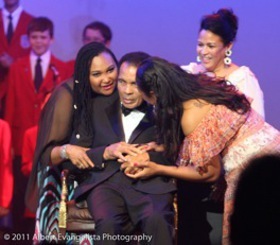 This touching story gave guests an inside peek into the remarkable character of Muhammad Ali. 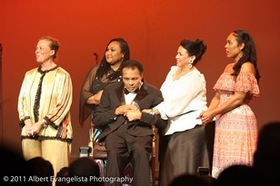 The crowd rose to their feet and began to cheer “Ali, Ali, Ali” as Muhammad Ali and his wife Lonnie took the stage. Lonnie praised her husband’s generosity, heart and spirit and spoke of the strides that both Muhammad Ali and Michael J. Fox have made in the quest for a cure for Parkinson’s Disease. Muhammad’s daughters Maryum and Hana Ali presented their father with his “Lifetime Achievement Award”, a gorgeous glass sculpture entitled “Night Dreams” created by artist Casey Hyland. Retired Army Lieutenant General William G. Boykin, who was a part of the infamous “Black Hawk Down” mission, delivered an important message about patriotism and the work that the Joe Foss Institute does sending veterans to speak with children in schools about their service to this country. Auctioneer Mark Drilling helped auction off incredible experience packages, which included a stay at Mindy and Glenn Stearns’ private home in Fiji, GRAMMY tickets and backstage meet and greets with GRAMMY Winners Chaka Khan and Lady Antebellum. The cutest moment in the show featured veteran turn soap star J.R. Martinez, who is partnered with Karina Smirnoff on “Dancing with the Stars” this season, who helped auction off a black Labrador puppy for charity. J.R. told the sweet story of being gifted a puppy in the previous year’s auction and how much unconditional love his dog Romeo has brought into his life. Marine Master Sergeant Paul Starner shared his remarkable story of never giving up after losing one of his legs in combat and how Wounded Warrior Project was so supportive in his recovery. Army Sergeant Neil Duncan who has been a favorite speaker at Life Changing Lives for the last three years, returned with the amazing news that as a double amputee, he recently made it to the summit of Mt. Kilimanjaro with two other wounded warriors. Both men received much deserved standing ovations of love and support. “American Idol” Season 9 Winner Lee DeWyze lent his soulful voice to the night singing a cover of U2’s “Beautiful Day” and his hit song “Sweet Serendipity”, from his album "Live It Up. Accompanying himself on guitar, Lee was the personification of cool. 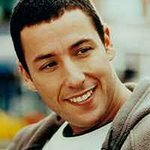 It was no wonder America selected him as their favorite Idol on his season of the show. Major General William Lyon USAF (ret) was honored with the “Life Changing Lives Hero Award” presented by his proud son Bill Lyon. International platinum selling recording artists The Tenors, who have a new album on the way and are playing sold out shows around the world, took the stage to sing “Always There”, a moving ballad in English and Italian. Clifton, Fraser, Remi and Victor’s four part harmonies were sweet music to everyone’s ears. The Tenors were joined by Lee DeWyze to sing Leonard Cohen’s haunting “Hallelujah” for a once-in-a-lifetime collaboration. Lee and The Tenors created a beautiful blend singing with unfaltering conviction and moving the audience to tears. Ambassador George Argyros was the evening’s final honoree joined onstage by his wife Julia and his children George Jr., Stephanie, and Lisa Argyros who presented him with the “Life Changing Lives Hero Award.” The grand finale welcomed back Lee Dewyze and The Tenors to the stage, with special guests “American Idol” Season 5 Winner Taylor Hicks and “American Idol” finalist Michael Johns all singing a rousing rendition of The Beatles’ classic “With a Little Help From My Friends.” The encore featured “American Idols” Lee DeWyze, Taylor Hicks and Michael Johns singing "Credence Clearwater Revival’s “Proud Mary” with Taylor doing an fierce harmonica solo. For more information about Life Changing Lives, click here.